After a savory Challenge last month, I was ready for a diabetic coma-inducing sweet dessert and this month’s challenge delivered. This challenge was hosted by Dolores of Culinary Curiousity, Alex of Blondie and Brownie, and Jenny of Foray into Food, and the amazing cake recipe was created by Shauna Fish Lydon of Eggbeater. I was forewarned that the cake and frosting may be overly sweet for some, so I decreased the amount of sugar and increased the fluer de sel accordingly. 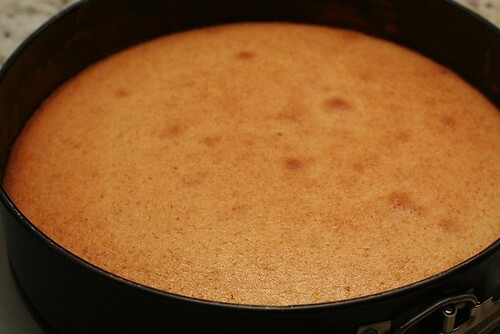 The end result was a rich, moist cake with a sweet, creamy frosting. 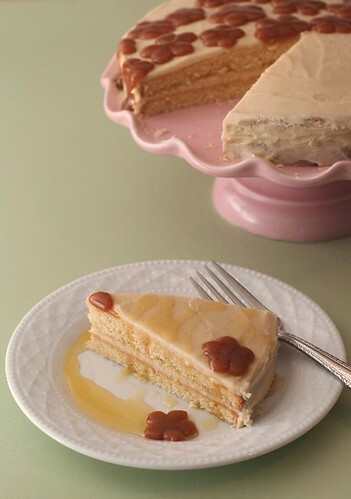 I used the optional caramel (see recipe below) to decorate the cake with floral accents. I then drizzled some of the leftover caramel syrup over the cake slices, which some might consider overkill, but my children sure didn’t. Turn mixer to lowest speed, and add one third of the dry ingredients. When incorporated, add half of the milk, a little at a time. Add another third of the dry ingredients, then the other half of the milk and finish with the dry ingredients. Whisk over medium heat until it has reduced slightly and feels sticky between two fingers. 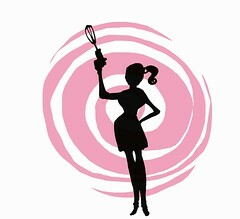 In a stand mixer fitted with a paddle or whisk attachment, add confectioner’s sugar a little at a time. 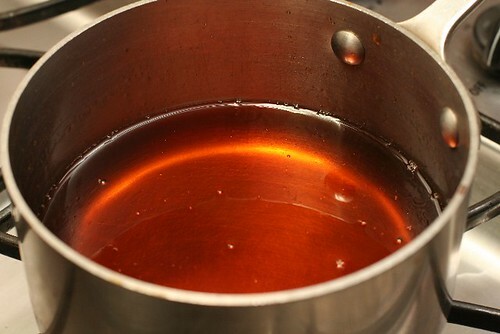 When mixture looks too chunky to take any more, add a bit of cream and or caramel syrup. 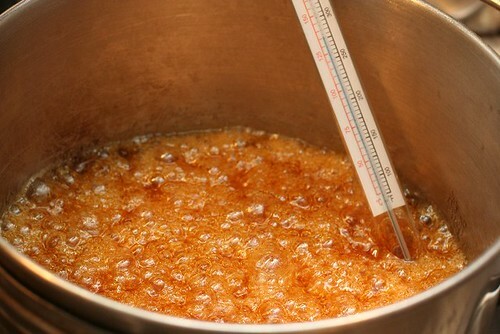 Repeat until mixture looks smooth and all confectioner’s sugar has been incorporated. Add salt to taste. I used two small floral cookie cutters to cut the caramel to decorate my cake. And to mask the lumpy icing job. The flowers are an incredible touch. Very nice. I really love the wat you’ve decorated your cake with caramel flowers. And there seems to be something about children and caramel! Its the same with my daughter. Wow lovely cake and the flower candy makes it even more so. Great job! Beutiful cake. I love the little caramel flowers. 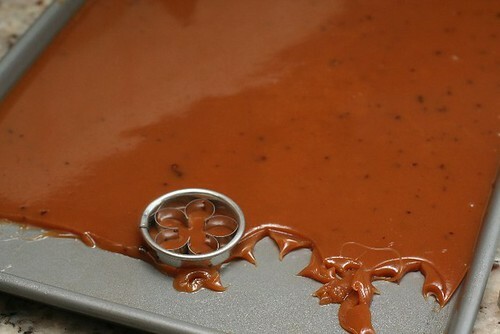 I would never have thought to use cookie cutters to get shapes out of the caramel. That’s some great improvisation. Beautiful job! Love the caramel shapes! BTW, I tried sending you an email via the DB site. I think we went to the same college. Perfect!Looks gorgeous with caramel floral accents. Beautiful cake! Those flower caramels are just darling. Lovely job!! Beautiful cake! 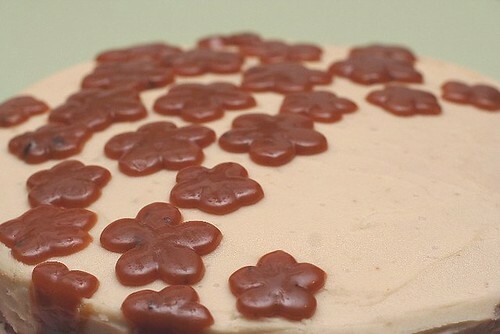 The patience it must have taken you to make those caramel flowers! Wow… if only for that you are worthy of great admiration! Also love those caramel flowers!!! What a wonderful way of using te caramels to decorate the cake! It’s beautiful! Great cake. Love the flowers. Very creative. What fun caramel flowers on top! Great job! Your cake is a labor of love. I feel the love through the fiber-optic superhighway. I love your flower caramels! Beautiful cake and presentation. I love your pink cake stand. Great job. Beautiful. I love the caramels you made. I wasn’t able to get them done with all the other holiday baking going on, but after seeing your lovely decorations I regret it. i love your flower cookie cutter and your idea of flower caramels. Your cake is gorgeous! Your cake looks amazing. I love that you used the caramels to help decorate. Beautiful. lovely decorations, really fantastic idea! I really tried to use the leftover caramel to make decorations but it didn’t harden like I thought it would…YOUR flowers, on the other hand, are SO cute!!! Great job on your cake. Love the decorations! So pretty. I really need to get myself a cutter like that. This cake looks amazing! I made it for my sister’s birthday and everyone loved it! I think it tasted a bit nicer the second day when it was in the fridge overnight. I added some chopped walnut to break the sweetness a little, but it didn’t even need it. It’s just perfect! Thank you for the recipe!! !